The memorial park is situated on the German defensive line which was attacked on 19-20 July 1916 by the Australian forces at the Battle of Fromelles. The Memorial Park was designed to commemorate the Australians who fought and died during the attack at the Battle of Fromelles on 19 to 20 July 1916. This was the first attack to take place by the Australian forces in France during the Great War of 1914-1918. The Memorial Park was opened at a ceremony on 5 July 1998 by the Australian Minister for Veterans' Affairs, the Honorable Bruce Scott, MP, in the presence of the Australian Minister for Defence, the Honorable Ian McLachlan, AO, MP. Cobbers sculpture by Peter Corlett. The sculpture of two figures in the centre of the memorial park is by Peter Corlett from Melbourne, Australia. It was commissioned by the Office of Australian War Graves. It was cast by Meridian Sculpture Founders of Melbourne, Australia, in 1998. 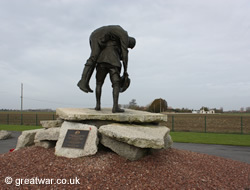 The sculpture is dedicated to the men who fought and fell in the Battle of Fromelles on 19 and 20 July 1916. 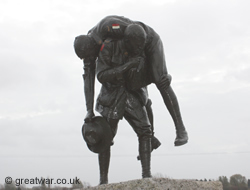 The figure carrying his comrade is based on the Australian soldier Sergeant, later Second Lieutenant, Simon Fraser. He was known as being one of the many Australian soldiers who bravely went out over three days and nights to bring in their wounded comrades from the field of battle after the Battle of Fromelles. The sculpted figure being carried by Fraser is based on a man from the 60th Battalion, a battalion which suffered very heavy casualties by the end of the battle. Cobbers sculpture. VC Corner Cemetery is on the horizon to the right of the figures. Simon had enlisted in July 1915. He was from the town of Byaduk in the State of Victoria. At the time of his enlistment he was a farmer aged 38. He had already served for 9 years as a Sergeant and Acting Colour Sergeant with the Victorian Mounted Rifles. In November 1915 he embarked for overseas service from Melbourne. In March 1916 he was taken onto the strength of the 57th Battalion, Australian Imperial Force (A.I.F.) at Tel-el-Kebir in Egypt. In April 1916 he was promoted to Sergeant and in June he sailed from Alexandria, Egypt, to the French port of Marseilles to join the British Expeditionary Force (B.E.F.) in northern France. From 30 March 1917 he was promoted to the rank of Second Lieutenant whilst at the A.I.F. depot in Tidworth on Salisbury Plain, and from 1 May he proceeded to join the 58th Battalion in France. 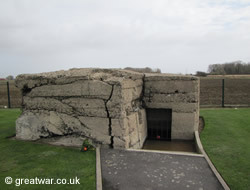 One of the German concrete bunkers in the Memorial Park. Simon Fraser was killed only a few days later in action during the attack on Bullecourt, east of Arras, on 11 May into the early hours of 12 May 1917. According to the statement by his commanding officer in his Service Record, Fraser was badly hit by a shell and buried by his unit in the trenches at Bullecourt. In 1919 a letter by one of his three brothers, Peter, was written to the Australian Base Records office asking if his brother Simon's grave was known. Peter stated that he had received a letter from one of Simon's comrades, Private F J Rollings No. 2555 of the 58th Battalion, to say that Simon had been hit in the head by shell fragments. Private Rollings and others had carried Simon's body back about 300 yards from the trench. They couldn't take him further back because of the shellfire and two of the men were wounded carrying the body back. They had buried him in a shell hole and had gone back three days later to erect a small wooden cross over the grave with his name, rank and number on it. Sadly Simon's remains were not discovered by the burial parties after the war for an identified burial and he is commemorated on the memorial panels as one of the missing in action at Villers Bretonneux Australian National Memorial. Bronze Memorial Plaque by Dr Ross Bastiaan at the Australian Memorial Park. Dr Ross Bastiaan is a Colonel in the Australian Army Reserve. He is a practising periodontist in Melbourne, Victoria. More than 140 bronze relief plaques have been placed worldwide by Dr Bastiaan at sites of action where Australian Forces have been involved. 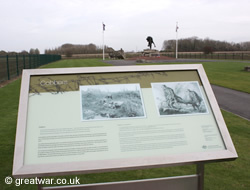 The Fromelles Memorial Park also has one of Dr Bastiaan's memorial plaques since 1993. 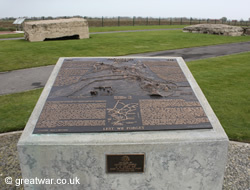 The plaque shows a bronze relief map for the Battle of Fromelles. 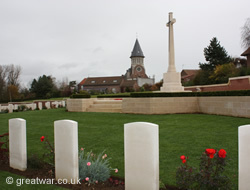 Latitude N 50° 37' 5" ; Longitude E 2° 50' 8"
See the cemetery dedicated on 19 July 2010 at Fromelles for Australian and British soldiers discovered at Fromelles in 2008. Australian visitors may be interested to see a website established by the Australian Government which provides information about the major sites to visit in France and Belgium where the Australian forces fought and where they are commemorated. (1) Second Supplement to The London Gazette no. 29890 of Tuesday 2 January 1917, Supplement dated Thursday 4 January 1917, page 256.